True relaxation is hard to come by in this modern world of ours. If we’re not proactive about planning time to recharge, it’s far too easy to put it off. Will you recharge with us on a wonderful healing journey to Australia and Fiji? 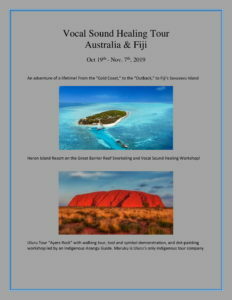 Join us for this almost 3-week deep intensive relaxation, rejuvenation Vocal Sound Healing Retreat in Australia and Fiji!! We arrive in Sydney, tour to the amazing Heron Island for a 3-day vocal sound healing retreat within a retreat, fly to the Outback for an Anangu Aboriginal-led Tour of Uluru/Ayers Rock, and do a dot-painting workshop. We hike, sing and visit waterfalls at the World Heritage Lamington National Park, then we head to Fiji’s Savusavu Island for the last 4 days of the trip and stay at a gorgeous house on a beach. This trip will be deeply healing and transformational. Gwendolyn leads daily healing, singing, nurturing activities, and you will be treated with special loving attention. Each day will be filled with song, laughter, healing & transformational activities w/ Gwendolyn! $5,750. USD per person sharing; $7,300 Single Occupancy. For details or to reserve your spot, Contact Gwendolyn@vocalsoundhealer.com. This price includes all transportation and lodging within Australia & Fiji and some meals. Individuals are responsible for R/T flights to and from Australia/Fiji. First installment $3250. due by April 15th. Balance due August 15th. Cancellation Fees apply.